We’re delighted to announce that Pulsin will join us as nutrition partner at the Portishead Sprint Triathlon this Saturday. Pulsin are becoming a regular at DB Max’s events in 2018 and their top-draw nutrition bars will be on hand to fuel all our DB Maxers at the finish line. This also gives us a great opportunity to introduce you to a couple of Pulsin’s key products which can be used in both triathlon training and racing. Raw choc brownies. 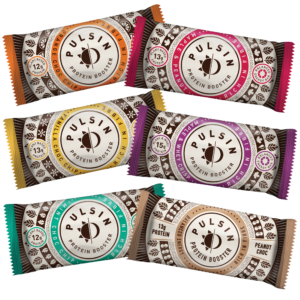 Anyone who’s tried these will know that despite managing to create a nutritionally packed snack, Pulsin have gone to great lengths to ensure taste isn’t compromised. The choc brownies come in a range of sweet and savoury flavours and are dairy, sofa and gluten free. Protein boosters. With 13g of plant protein, these bars are ideal for post-training (or race) recovery. A little tip for you…with a cookie dough taste and texture, we highly recommend the vanilla choc-chip flavour. Porridge oat bars. The goodness of porridge. In a bar. Simple. Using 100% natural ingredients and 30% less sugar than other oat bars, we particularly love the Apple and Cinnamon flavour. Protein is a key nutrient, particularly for anyone taking part in sport. Some of us get enough in our diet naturally, but there’s certainly a place for supplementation. The protein supplement market is saturated with many brands claiming to make the best, tastiest flavoured powder. But the problem with most protein powders these days is they taste very synthetic and artificial. You might be getting the grams of protein you need, but it doesn’t necessarily feel like you’re doing your body a favour. And that’s where Pulsin’s pea protein powders come in. You can choose from four vegan powders or three natural whey powders, so whatever your diet you know you’re covered. And rather than create the most appealing sounding flavour, they’ve gone natural (flavourless) on them all. It’s a bold statement, but it leaves you with ultimate versatility on how to use them. Chuck a scoop in your morning smoothie, add some to your cereal or even throw some in your spaghetti bolognaise for an extra protein punch. We hope all you DB Maxers taking part in the Portishead Sprint Triathlon will try some of the products and say hi to the Pulsin team – it’s great to have them on board.